Born in Poznan, Poland in 1962, Błaszkiewicz began his studies at the Special Music School of Poznan with Mieczysław Wierszczycki from 1972-1977. From 1977-1981, he was a violin pupil of Professor Wojciech Maliński at the local music academy. While there, Błaszkiewicz began studies in piano performance with Eugeniusz Jasielski. Blaszkiewicz went on to attend the University of Arts in Berlin, where he was a student of Professor Michel Schwalbé. 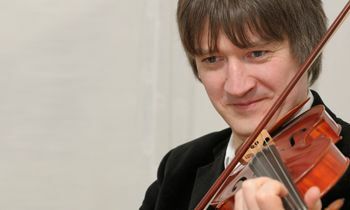 Błaszkiewicz is a finalist in many national and international violin competitions. In 1978 he won first place in the National Polish Music Competion in Lublin, and in the same year, he received an outstanding acknowledgement for being the youngest participant in the 'Poznan Violin Competition'. Błaszkiewicz has performed with major orchestras such as the Gewandhaus Orchestra Leipzig as well as with the RIAS Youth Orchestra. In addition, he has made numerious recordings with both Polish and Hungarian Radio. He has been first violin as well as solist for various ensembles, which include The Jupiter Ensemble, Quartetto Sereno, Quartetto Serioso und the baroque ensemble Musica da Camera in Hungary, Italy, Austria, Poland and Switzerland. With duo amortal, consisting of Bettina Hartl and Błaszkiewicz, the duet performed at the Munich Philharmonic and the Berlin Philharmonic as well as in Spain, Italy, Greece and Portugal. One of Duo's the musical highlights together with other guest members was to perform internationally during their Japanese Tour in 2005.